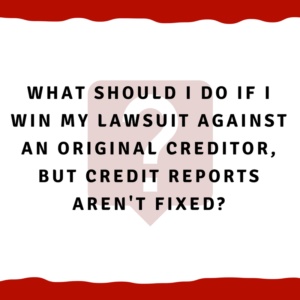 What should I do if I win my lawsuit against an original creditor, but credit reports aren't fixed? What should I do if I win my lawsuit against an original creditor, but credit reports aren’t fixed? Let’s say that you’ve already won your case, and you go the credit company and let them know that you don’t owe the debt on your credit report. You ask them to fix your reports so that your reports will be accurate, and they don’t do it. They reach out to Capital One (or whoever the original creditor is) and ask them about it. Unfortunately, Capital One says to keep that now false information on there. I strongly suggest that you look at suing them under the FCRA (Fair Credit Reporting Act). The Fair Credit Reporting Act states that your credit reports have to be accurate. So if you’ve been sued by Capital One, you say that you don’t owe the debt at all, and the judge rules in your favor, the debt must come off of your reports. Sometimes these companies will keep the debt on your credit report. When they do this, we can recognize what they’re doing, and encourage them to take this information off of your reports. So you talk to Experian, TransUnion, and Equifax to let them know that you don’t owe the debt. Then they will reach out to the credit company and ask what they should do. If the credit company says to keep it on there, then the reporting agencies will keep it on there. Now, they would disagree and we would have to look at the details, but in general, they’re violating the FCRA. In our opinion, that’s a major violation. We’ve filed many of these lawsuits, and those lawsuits have resulted in some pretty substantial settlements. Because if you have a judge that gives an order that says you don’t owe the debt, and the credit reporting companies decide to ignore the judge and keep that information on your report, that kind of wrong behavior needs to be punished through punitive damages. If you find yourself in this kind of situation and you have questions, feel free to get in touch with us. We would be glad to answer any of your questions and help you figure out your best course of action. You can reach us by phone at 1-205-879-2447, or you can fill out a contact form and we will get in touch with you quickly. We look forward to chatting with you.